Instead of adding to the driving experience cacophony, windshield wipers can be used to enhance musical audition, reinforcing a beat by hiding their cabin noise in the rhythm, increasing the signal:noise ratio by increasing the signal and masking the noise, and providing "visual music," the dance of the wipers, as a welcome side-effect. "VMP" (pronounced /vimp/) is acronymic for 'Visual Music Player,' a synaesthetic audio-visual renderer. Inspired by the hit TV show "Pimp My Ride," in which cars are outrageously customized, our intention is to recast the windshield wipers of an automobile with advanced multimedia technology, by allowing the wipers to dance to music. We have programmed a beat detector using "Pure Data," a dataflow development environment similar to "Max/MSP." A musical beat signal is filtered to drive a phase-locked loop, which signal triggers choreographed, articulated gestures in virtual, actual, and model windshield wipers. We use a cyclic buffer to implement a moving ("windowed") average, effectively a low-pass filter of inter-event intervals, a digital phase-locked loop used to propel the selected rhythm. A choreography module maps the PLL beats into segmented gestures used to drive windshield wipers in three styles: virtual, through a driving simulator; real, pulsing a standard wiper motor; and miniaturized, through a stepping-motor actuated model wiper. 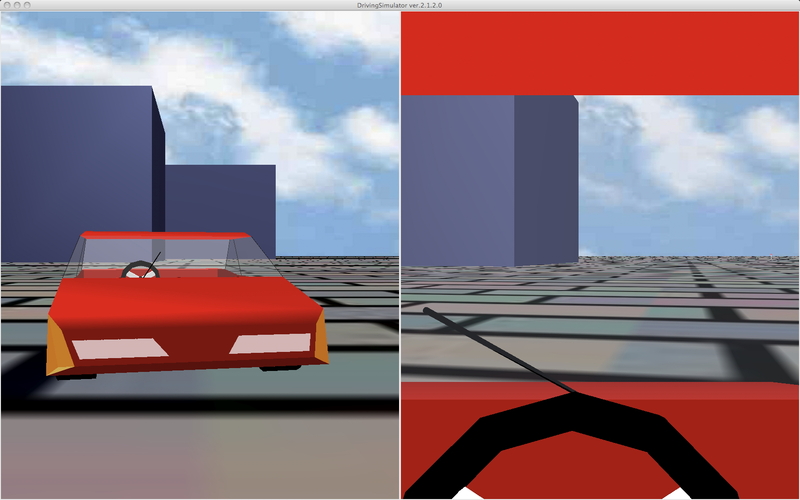 A driving simulator, implemented in Java3D, renders the virtual gestures. Mechatronic interfaces use signals generated by the DPLL to trigger the physical wiper cycles. Two USB ports synchronize custom circuits driving (flash memory) Peripheral Interface Controllers (PICs) to motivate the motors. 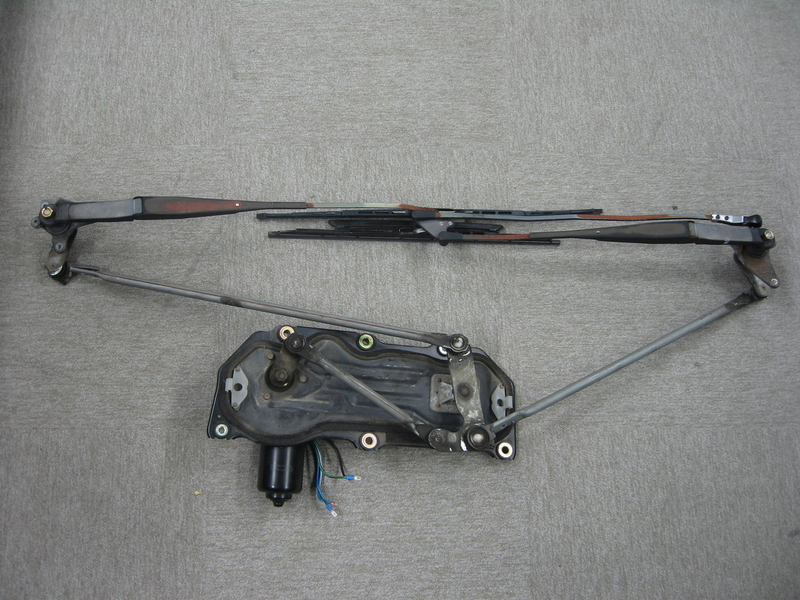 For the full-sized version, a normal automobile wiper assembly transduces the drive energy; for the model, a stepper motor drives a miniature windshield wiper. After selection of a song, the wipers automatically lock onto its beat. The choreography module deliberately articulates the wiper sweeping gesture to avoid the rigid cadence of even intermittent wipers, breaking the wiper stroke into quarters for the purposes of this proof-of-concept, to make the visual rhythm easy to see. An external audio port invites attendees to plug their own music players into the system to express their own music through the dancing wipers. All this happens without user intervention, "under the hood," as it were. The user simply starts up the music on a music player, and when the wipers are launched they "find the beat," locking onto the rhythm detected by the software. Although car companies have improved their sound isolation technology, the sound of windshield wipers comes from their scraping across the windshield. If this gesture is suitably impulsive, it serves as a satisfying percussive sound, snapping sharply across the window. We therefore programmed aggressive transitions for the wiping gestures, allowing them to snap smartly with the musical rhythm. The wipers can be started with arbitrary rate and phase, and accompanying music chosen to exactly match the tempo, reversing the coupling and letting "the tail wag the dog." This is possible because much popular music, such as dance music, has a particular tempo sustained for the song. A slightly more complicated process involves explicitly parameterizing a song to match the tempo: the music can be adjusted to fit the wiper rhythm. A MIDI sequencer can be used to "tap in" such a tempo on a trackpad with implicit phase, which renders a MIDI programmed song at the specified rhythm. To allow unrestricted response to the rhythm of music, beat detection and phase-locking loop (PLL) are required. Our data flow essentially realizes a basic DPLL (digital PLL). Modern beat detection algorithms, while not perfect, do a fairly good job. We have programmed such a beat detector using "Pure Data" ("PD"), a dataflow development environment similar to "Max/MSP." We use an "aubiotempo" [sic] patch to extract the beat. (The name prefix is probably deliberately dyslexic to highlight its organic, biological inspiration.) There is some jitter, and occasional missing beats, but it is robust enough to track most popular songs. A digital music player (such as an iPod or modern mobile phone) serves as a audio source. Such generalized stereo signals can be captured by our audio port, and used to drive articulated wiper gestures. We use a cyclic buffer to implement a moving ("windowed") average, effectively a low-pass filter of inter-event intervals, a digital phase-locked loop used to propel the selected rhythm. This buffer is pre-seeded with default values (like 120 bpm), and the initial values are propagated to all the registers to minimize start-up synchronization. The system was tuned to make the circular buffer "sufficiently long" (ten taps, in the latest version). This filter automatically interpolates beats, even if they are missed by the beat detector. A driving simulator, implemented in Java3D, renders the virtual gestures. Mechatronic interfaces use signals generated by the DPLL to trigger the physical wiper cycles. Two USB ports synchronize custom circuits driving (flash memory) Peripheral Interface Controllers (PICs) to motivate the motors. For the full-sized version, a normal automobile wiper assembly transduces the drive energy; for the model, a a stepper motor drives a miniature windshield wiper. If the system had significant mechanical inertia, the expressions would arrive behind, or after, the intended beat. The tempo would be correct, but the phase would be displaced. In such circumstances, audio rendering could be adjustably delayed to resynchronize the visual and auditory accents. However, the performance of our system is satisfactory, and such measures have not been necessary. After selection of a song, the wipers automatically lock onto its beat. The choreography module deliberately articulates the wiper sweeping gesture to avoid the rigid cadence of even intermittent wipers, breaking the wiper stroke into quarters for the purposes of this proof-of-concept, to make the visual rhythm easy to see. If the music is in common time (4/4 standard meter), the interstroke phase is preserved, repeating every two cycles. Rubato in musical interpretation refers to intentional variation in tempo, a kind of temporal jitter, but musically deliberate, according to the performer and performance. Our beat detection and DPLL are sensitive to such expressions, including accelerando, ritardo, cadence, and other variations, and they are reflected in the musically driven parts of the vehicle. All this happens without user intervention, "under the hood," as it were. The user simply starts up the music on a music player, and when the wipers are launched they "find the beat," locking onto the rhythm detected by the software. If the tempo of a song is doesn't change too suddenly, phase drift is negligible. Like "Snowball," the phenomenal dancing cockatoo, our system occasionally falls out of beat, but then soon recovers. The wipers have three manifestations: virtual, full-sized, and miniaturized. The virtual display allows switching between egocentric (1st-person) and exocentric (3rd-person) perspectives, as well well as effects like time-of-day and fog. Leveraging the self-containedness of the battery-powered R/C model car with sound display, laptop computer, stepping motor wiper, we are working on making the demonstration "free-ranging," navigable around the exhibit space. 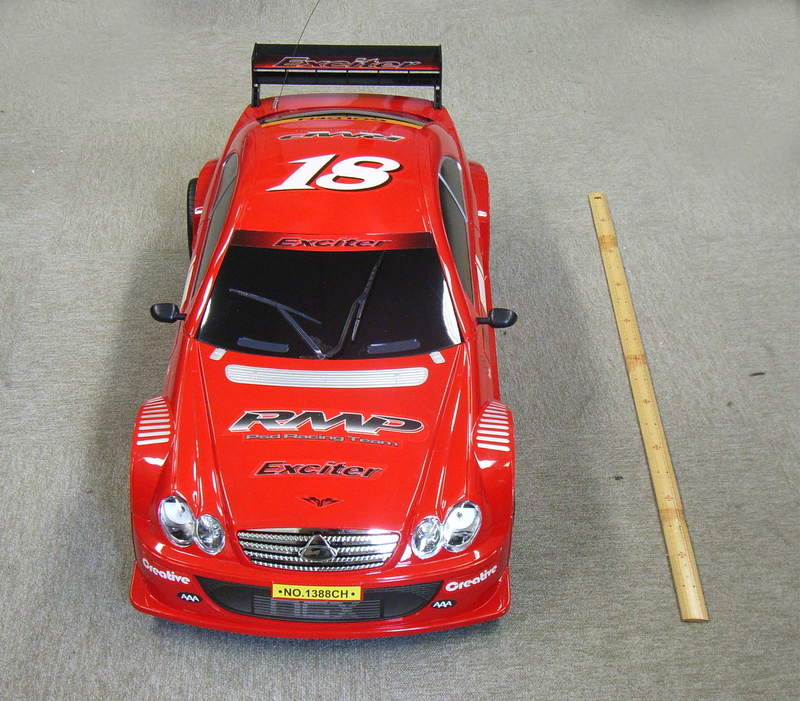 The laptop computer can be installed as payload in the model car, and the radio-controlled model can be driven around to entertain visitors and lure them to the booth for a fuller demonstration, its native circuitry, the custom hardware with PIC, and the music-synchronized wiper all powered by on-board batteries. An external audio port invites attendees to plug their own music players into the car to express their own music through the dancing wipers. The movie "Flash of Genius" celebrated the invention of the variable speed, intermittent "Kearns Blinking Eye Wiper." The ideas of expressive cars have some precedents in culture and transportation: The 50s American television sit-com "My Mother the Car," the 80s action series "Knight Rider," and the computer graphic movie "Cars" by Pixar all had anthropomorphized automobiles. In the future, the winkers (a.k.a. blinkers or turn signals) might also be synchronized with such external signals. A turn signal can be directionalized according (intuitively, naturally), perhaps decoupling external lights, which are subject to legal considerations, from internal confirmation, which is more flexible. Since the period, tempo, cadence, phase, rhythm, accents, and even timbre of the turn signal indicator are somewhat flexible they can be reset to piggyback on the musical beat, forced to match the beat of the song, optionally slaved to the windshield wipers. To suggest such possibility, our virtual model includes such flashing. We believe this research to be ripe with opportunities for future extensions. Shuffle beat, triplets, waltz time can all be expressed as rich wiper gestures, modulating stroke arc, timing, duty cycle. Pairs of wipers need not be synchronous, so there is a fertile design space to be explored. "Roboter mit menschlichem Antlitz," broadcast on 23.11.2009 on "Deutschlandradio Kultur"
"Ernsthafte Technikspielerei in Japan," broadcast on 24.02.2010 on "Deutschlandradio Kultur"